Google Webmaster Tools provides a useful way to monitor how well your site is performing in search engines and to track a range of statistics. It’s a useful tool to show whether an SEO campaign is effective and which content on your site draws the most attention. It can also be used to measure the click-through rate (CTR) which can help identify whether your metatags could be improved. 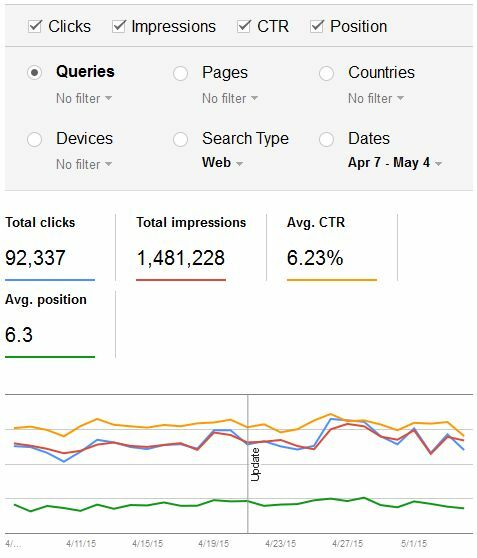 This blog introduces you to the new Search Analytics Tool and provides some tips on how to get the most out of it. “We’ve made the new Search Analytics report available to a random sample of our users. In my opinion the new Search Traffic interface is vastly more user friendly than the previous one and gives you access to a wider range of SEO data in a visual format far more easily. To use it, you need to register for a free Webmaster Tools account (which involves verifying you own the website, but not adding code to every page, unlike Google Analytics). Webmaster Tools – What’s New? If you’ve been randomly selected for the new interface then when you first login to Webmaster Tools you’ll notice that instead of a graph showing impressions, the summary graph shows the number of clicks through to your website. This information is more useful, as it tells you how many visitors visited your site directly from Google over the last month (it ignores visits from other search engines, links from other sites, direct visitors, etc.) This makes it useful when measuring SEO, but not the traffic to your site as a whole (a good SEO campaign will also drive traffic to your site from articles, infographics, etc. as well as helping boost your position with Google). To access the new Search Analytics tool, click ‘Search Traffic’ in the left-hand menu, then click ‘Search Analytics’. Arguably the most useful SEO Chart to identify which keywords to target is if you tick 'Clicks' and 'Position'. This shows you the keywords on your site that receive the most clicks along with their average position in the search results. If you have keywords that receive a large number of clicks but aren't in the top few positions, it suggests that improving their position is likely to give you a great return on investment. Clicks – The number of clicks from Google to your site. Impressions – The number of times your site’s metatag Title and Description have appeared in Google’s search results, regardless of whether they’ve been clicked. CTR – Click Through Rate, Clicks / Impressions x 100 (How often your Title is clicked as a percentage of the number of times it’s shown). Position – The average position in the search results for all the keywords it’s appeared for (1 being first place). Queries – Search terms entered into Google - The keywords your SEO campaign is generating results from. Pages – Which pages on your site are being visited - Often a handful of pages will account for the vast majority of your traffic, so focus on ensuring that these have a great design and read well. To filter the results to just some pages, click Pages, scroll down and click the page you want to filter by, then click Queries and scroll down and you'll see the Keywords that apply just to that page. You can also add filters manually by pressing the small drop-down arrow underneath each heading. Countries – You can probably figure this out for yourself! Devices – Shows visits from Desktops, Mobiles and Tablets – Helps you define how important a responsive design is for your website. Search Type – Visits from users looking for Web, Images or Videos. Dates – Choose from the last week, month, quarter or a custom range. This also lets you compare 2 different date ranges! Being able to view all this information and add filters to only show data for specific sections of your site lets you easily see what the important areas are to focus on and where your SEO campaign is succeeding or where it needs more work. Links to your site – Who links to you and what text they use. Internal Links – Which internal pages each page on your site links to. Manual Actions – Whether your site has any manual penalties applied to it. International Targeting – Which country your site targets (this can’t be set for country specific domains like .uk or .fr, but can be set for international domains like .com or .net, if you want to target one specific country). Mobile Usability – How mobile friendly your site is. The ‘Update’ line shown in the various charts is Google’s way of drawing your attention to the new Google mobile friendly algorithm update on 21 April 2015. This last tag – Mobile Usability – lists all the pages on your site that aren’t mobile friendly, along with the usability errors on each page. 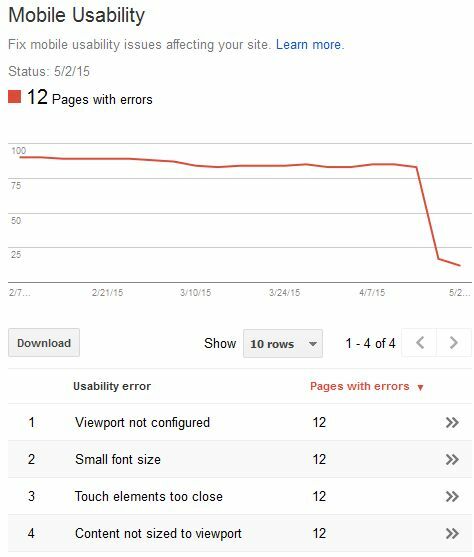 If you’ve recently made your site mobile friendly, then as Google indexes each page the number of errors will gradually go down, as in the chart below. The latest updates to Webmaster Tools have really made it much more user friendly and we hope this blog helps you to gain the most from it.